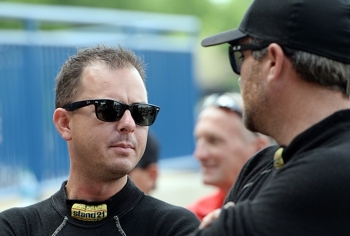 July 6, 2014 -- Steve Torrence made one of the quickest competitive runs of his pro career Sunday at Summit Motorsports Park but couldn’t parlay it into a much-needed victory in the eighth annual Summit Racing Equipment Nationals. 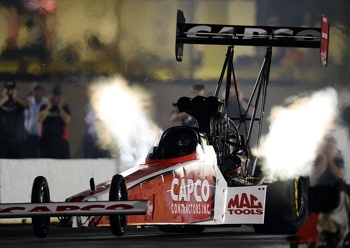 In fact, after dispatching three-time former World Champion Larry Dixon with a 1,000 foot time of 4.780 seconds, Torrence didn’t even get a chance to pick his lane for a quarterfinal match with eventual race winner and 2012 series champ Antron Brown. “There probably are 10 cars out there right now that have a legitimate shot to win every week and I’m thinking it must be getting close to being our turn again,” said the 31-year-old resident of Kilgore, Texas. “We’ve had a great car all year but so many things have to go right to win one of these things. Torrence, who is trying to become the first driver in NHRA history to win world championships in both the alcohol and nitro classes, will have his next chance to get a breakthrough first season victory when the Mello Yello tour moves to Denver, Colo., in two weeks for the 35th annual Mopar Mile-High Nationals. He was the No. 1 qualifier at last year’s race. Despite his early exit Sunday, the avid outdoorsman wasn’t overly disappointed. After all, he did beat Dixon for the first time in his career and, after five straight first round losses, also managed to get his car into round two and solidify his hold on sixth place in Mello Yello points.